The Marshmallow Staircase - "Planet Express"
This is one deliriously tripped out album! Scranton, PA space explorers The Marshmallow Staircase deliver a raw, lo-fi blend of pulsing Krautrock rhythms; Hawkwind-style guitar riffing; punky Chrome-like edginess; strange, psychedelic sounds; distorted, spooky, echoing voices; and space-freaking electronics zapping all over the place. 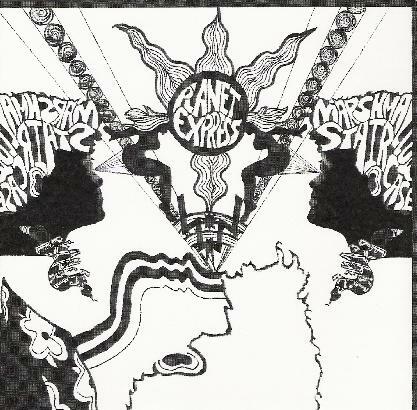 It's hard to pinpoint any real "songs" per se on this album, but that's no problem at all, because Planet Express is chock full of demented space jams, zoned out sonic experiments, and mind-bending freak outs, all ranging in length from 55-seconds to 9 ½ - minutes, most falling within the 1-3 minute length. But it is all totally solid stuff, and definitely totally out there. Add to it all the fact that AI favorite Psychatrone Rhonedakk produced the album, and you definitely have a recipe for some way out weirdness. I wish there was more I could say about this album, but you just have to hear it. Don't be shy... climb the Marshmallow Staircase and hop aboard the Planet Express for one wild and woolly, totally demented, hallucinatory cosmic rock n' roll trip into another dimension of space and time! This is great stuff! Recommended! For more information you can visit The Marshmallow Staircase web site at: http://www.myspace.com/themarshmallowstaircase. Visit the Summersteps Records web site at: http://www.summerstepsrecords.com.